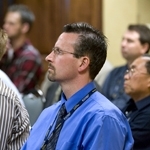 GARBC Conference workshops address current issues and offer practical ministry helps. Plan now to attend the conference June 23–27 in St. Petersburg, Fla. Register by May 16 to receive a discount rate. Don’t miss the opportunity to learn in a supportive atmosphere! Attend the 2014 GARBC Conference. Develop skills—TFC provides an intentional opportunity to train and equip students for particular ministry roles such as vocal and instrumental performance, preaching and speaking, and Bible teaching. Build confidence—TFC helps students gain confidence as they practice and improve their skills for serving the Lord. Gain direction—TFC gives students a high view of ministry and prompts students to consider roles God might desire them to fill in their future. Make friends—TFC brings students from many churches together for competition. These events contribute to a growing network of friends. Establish identity—TFC cultivates in students a sense of heritage and connection with like-minded Baptists from across the country. Receive recognition—TFC rewards students with state and national recognition for participation and achievement in performance with the potential of earning college scholarships. Register now for National Open and Group Competition. The deadline to register is May 19. Experience the convenience of reading the Baptist Bulletin, Digital Edition, anywhere you go! Visit www.BaptistBulletin.org/digital. Subscribers receive an e-mail alert when a new issue is available. New subscribers can also find us online at the iTunes store, Amazon.com, and the Google Play store. The Baptist Bulletin, Digital Edition, offers everything from the print edition, along with additional pages called Bb Plus, designed to enrich your ministry. Try it; you’ll like it! Five-Lesson Evangelistic Studies for 99 Cents! RBP’s evangelistic studies are affordable tools to use in your community. Outreach Bible studies are normally $4 to $5 each, but RBP has just reduced the price of eight titles to 99 cents each. Order your copies and begin sharing Christ through the study of God’s Word. Posted in e-INFO, Improving Your Ministry Skills, May 2014 on April 23, 2014.